Hope everyone’s August is off to a good start. With that, here are the latest social media updates you may have missed. Facebook Messaging App Raises Privacy Concerns: Facebook will shut down the messaging feature of its native mobile app in the coming days. The move is meant to force users to download its Messenger App, leaving many upset. Further upsetting Facebook users are of some of the app’s features buried in the Terms of Service. According to the Terms of Service the app will be able to place calls, send SMS messages, record audio, and take pictures without the user’s permission. LinkedIn Updates Member Profiles on Mobile App: LinkedIn gave profiles a makeover for their mobile app. The updated profiles prominently feature the job title, company name, shared education or job history, and common interests of any user you look up. The updated profiles now also feature any recent posts you wrote on the LinkedIn site. 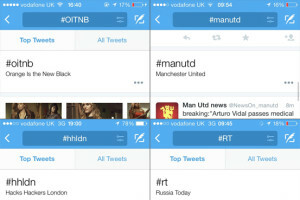 Twitter Testing Hashtag ‘Translation’ Feature: Twitter is testing a new feature that would add a definition to commonly used hashtags during search on its mobile app. The feature would be very helpful for new users who are curious as to what hashtags that are taking over their timeline mean. The feature was first spotted by Twitter users in Europe and so far there has been no official word from Twitter regarding this feature. Image reprinted from The Wall Street Journal.